In February 2018, leading experts in meditation from different traditions will gather at the University of Divinity to discuss the evolution of meditation historically and its relevance today. The contributors are experts and practitioners of meditation. They are recognised as contributing to research and practice in several areas: historical studies of meditation; religious traditions of meditation, the science of meditation in its clinical and therapeutic uses, and the use of meditation in education settings. Lunch, refreshments and tea & coffee will be available. Dr Annette Webb is a Consultant Paediatician, Gastroenterologist and Clinical Hypnotherapist. Her MD doctoral thesis was in the area of mind body therapies for Chronic and Complex Abdominal pain. Annette has been meditating since she was a child and has completed formal qualifications in Mindfulness and Stillness Meditation therapy. Annette was employed as a staff specialist at the Royal Children's Hospital, Monash Children's Southern Health and Cabrini Hospital's In Melbourne and is currently in private practice. She continues to utilise meditation practices in her personal and professional life. 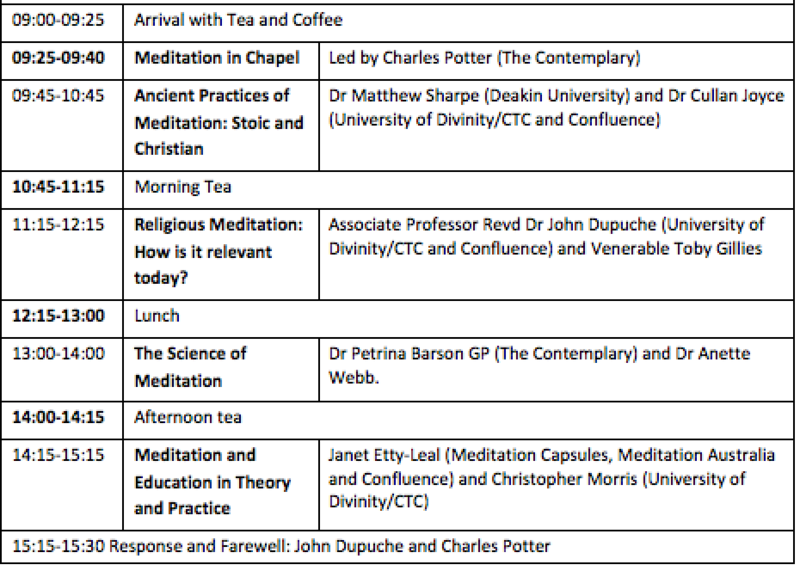 Christopher Morris is a lecturer at the Catholic Theological College Melbourne in Christian Spirituality and in a Graduate Course in Meditation. He is a PhD candidate focussing on the Christian wisdom tradition. Christopher is also a spiritual director and oblate of the Camaldolese Benedictines. Dr Cullan Joyce lectures in philosophy at Catholic Theological College. His doctorate is on the thought of Maximus the Confessor, a pivotal Early Christian ascetic. He is presently researching how Maximus’ work relates to contemporary studies in meditation. He is the founding director of Confluence. Associate Professor Matthew Sharpe teaches philosophy and Deakin. He has published extensively on the history of Western conceptions of philosophy as a way of life, and is presently working on a co-authored monograph on the subject. He has a particular interest in Stoic philosophy, and the Roman Stoics Epictetus and Marcus Aurelius. He is also presently co-translating a volume of essays in the area by renowned French classicist Pierre Hadot. Dr Petrina Barson is a certified and senior teacher of the Compassion Cultivation Training (CCT) program originating at Stanford University’s Center for Compassion and Altruism Research and Education. CCT is a program which draws from traditional contemplative practice and the science of mindfulness and compassion. She has been teaching CCT to medical students at the University of Melbourne since 2014. She is currently involved in research into outcomes of this program amongst medical students and is an Honorary Fellow in the Department of General Practice. She is a long-term member of a progressive Christian community, which inspires and supports understanding of compassion. Venerable Toby Gillies has been presenting courses in Buddhist philosophy and the theory and practice of meditation since 1980. He was granted full ordination in 1986 and accepted into the Sera Jey Monastic University in Mysore India. He has completed a study of the five major fields: Logic, Phenomenology, Ontology, Transcendental Wisdom and Monastic Discipline. He regularly teaches these fields as well as the esoteric Vajrayana (tantric) theory and practice. Toby has conducted numerous group and solitary meditation retreats ranging from two weeks to five months in duration. Retreat schedules ranged from seven hours meditation a day up to fourteen hours a day. He has maintained a consistent daily meditation practice for more than forty years.